(Newser) – They're not household names—the Rev. Robert Hunt, Capt. Gabriel Archer, Ferdinando Wainman, and Capt. 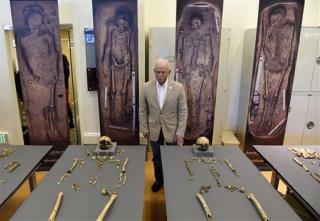 William West—but archaeologists have identified the remains of those four men as high-ranking leaders of Jamestown, reports NPR. In a sign of their importance, the four were buried in a church, the first Protestant one in America, reports AP. Researchers say one of the most intriguing discoveries is a small silver box buried with Archer. It's believed to be a Catholic reliquary, which is odd considering the church was Protestant. A post at the Atlantic calls it a "historical bombshell" because it suggests "researchers may have just discovered proof of an underground community of Catholics—including Archer and perhaps the person who buried him with the relic—who pretended to be Protestants." What's amazing is that religion still has the power to divide us. Knowing the Catholic church, I would venture to say spies. this is very interesting. catholic things found where only angelic religion was practiced. was it secret.